I had just pulled into the driveway in Brampton when a large bird flew over my hood and grabbed another bird from the lawn near my car. There was a flurry of feathers and by the time I grabbed my phone I managed a few pics. It was a vicious attack and there were a lot of flying feathers. 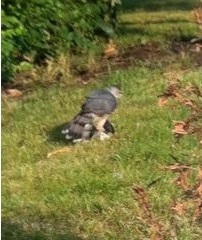 I am familiar with the Red Tailed Hawks in the neighbourhood, but didn't recognize this one. I was amazed by the precision attack. I think there's one sitting in a tree in Warbler Woods, London. I've never seen one before. This happened to me in Peterborough the other day. Was looking out my patio door and swoosh! One came out of nowhere and grabbed a small bird off my porch! 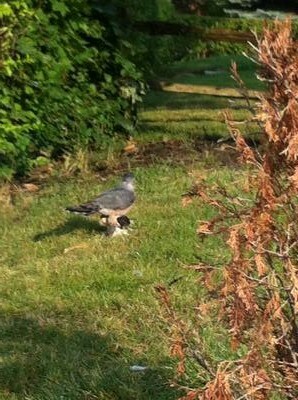 Feathers everywhere - flew off with it in its talons. Never saw anything like it! 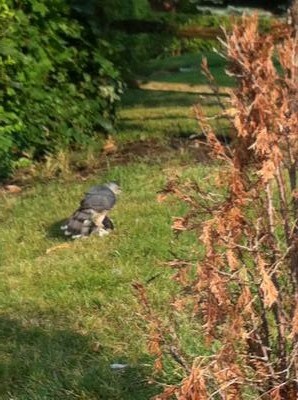 I have never seen a hawk in the city before. You're correct on the Accipiter's ID.